A chic, translucent pink champagne flute. An amber-hued plate that looks so delicate that you can’t imagine using it as dinnerware. A pale yellow bowl with a precise geometric pattern. These vintage pieces have been elevated and prized as collectibles in the age of Instagram, but back when they were made in the 1930s, they were practically given away for free. 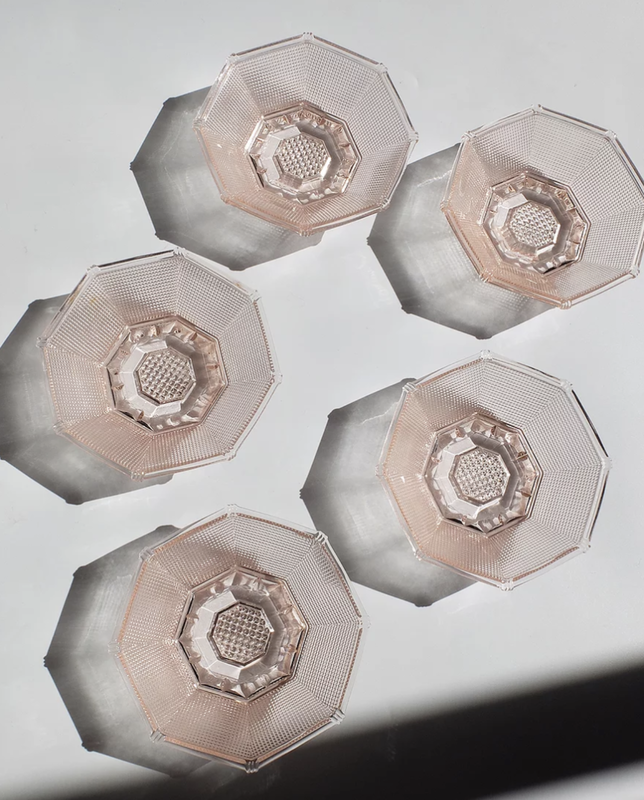 Depression glass is having a moment that seems ironic, given its history. Made in the United States during the late ’20s through the ’30s, mass-produced (read: cheap) glassware in assorted pastel hues could be acquired in a number of ways. Often packaged as a freebie along with consumer products like oatmeal or simply given away in shops as a marketing bid for more customers, depression glass was easily accessible among a wide demographic. Now, though—since it’s been considered a collectible since the 1960s—it’s a bit trickier to find. Genuine depression glass was made by about 20 manufacturers, most commonly in colors like amber, pink, and green and more rarely in hues like purple, blue, and yellow. (The less common colors, now, are considered even more collectible). For those who prioritize authenticity above all, a handbook (like Gene Florence’s now out-of-print Collector’s Encyclopedia of Depression Glass, which was originally published in 1974) can be especially helpful to identify genuine Depression-era glassware. For those who simply like the look of depression glass, it’s a lot less complicated. In pink and amber hues, depression-era glassware feels on-trend and contemporary—that’s precisely why you’ll find near-replicas in Anthropologie and Target. When you do go the vintage route, however, you can manage to snag some good deals. After all, it is glassware that was made to be a bargain. Replicas made in the 1970s can be easier to find than the original (look for those by French brand Luminarc), in addition to reproductions made as early as the ’50s. Not feeling picky? Head over to eBay or Etsy, and search for “depression style” glassware in whichever hue you’re most drawn to—you’ll have plenty of options that, at the very least, look authentic, even if they aren’t 90-something years old. At garage sales and antique stores, you’re likely to find some great options as well. Feeling bored by your plain white set of dishes? Do some digging on eBay and you can replace them with the perfect translucent pastel alternative. Simply looking for a few decorative dishes to accent your collection of dinnerware? Depression glass works in both a collection and on its own. Life’s too short to eat on plates you don’t even like, and ones that spark joy don’t have to come at a major cost. When it comes down to it, depression glass is something joyful that came out of a hard time in American history, and whether you sip champagne or sparkling water out of a rose-hued coupe, it’s impossible not to smile.